This is a great way to use up your eggs before they get old. For hearty and filling breakfast or as easy quick lunch on busy weekdays. 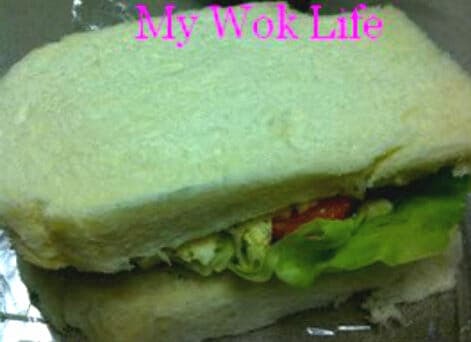 Though egg mayo sandwich is very common, but its taste created from my recipe is unusually delicious. I learned this from a chef friend who taught me to make the egg mayo this way. The addition of butter to the mayo smoothens the egg mixture even further. And I considered this egg mayo sandwich as an egg salad sandwich. More vegetables and tomatoes to go with it, for more balancing diet. The extra crunch also yields refreshing flavour in the palate, just like having a salad bowl in the sandwich.. Try and you will like it! 1) In a small bowl, mix together mayonnaise, butter and salt. Using a fork, mash hard-boiled eggs together with the mayonnaise mixture in the bowl. Sprinkle salt and black pepper and mix well. Chill thoroughly. 2) For each sandwich, place 2 lettuce leafs, followed by cherry tomato halves onto 1 slice of bread. Spoon over 2 tablespoons of chilled egg. Top with another slice of bread. Repeat steps for another set of sandwich. Serve or pack to work/ school. 1 generous serving of egg mayo thick sandwich counts about 340kcal. Tips: Avoid over boiling the eggs in order to retain more moist in it. If find hard boiled eggs too dried after mashed in, may add 1 teaspoon of milk to add moisture into the egg mixture. * Use low-fat Mayonnaise, if desired. * Serve with chilled egg mixture, or reheat the whole sandwich in a microwave for 1 minute when ready to tuck in. I personally like it warm. this is one of the favourite sandwiches, yummy! Love egg salad sandwiches! I sometimes add crumbled bacon to the egg mixture, pickle relish,and mayo.With the addition to the sandwich I sometimes have a few potato chips… Nice lunch!! It is mine, too, and hubby’s, who has soft spot for eggs, especially.. I think it’s good idea to add some crunchy bacon.. As for pickles, I would prefer to be added to hotdog, just like Orange Juius’s! Your blog is such a great recipes blog! Why didn’t I find your site earlier! Love the recipes you posted and can’t wait to try this recipe & the taiwan shredded chicken congee recipe! May I know where can I find coriander, fish sauce and hoisin sauce? Ok.. It’s very convenient to get those ingredients and condiments at grocery shops, mini marts and supermarkets, especially. Corriader can be found at vegetable section or chilled fresh vegetable compartment. It is called cilantro, too. While fish sauce and hoisin sauce are bottled. Fish sauce is liquid and hoisin sauce is in paste form. They are at condiments cell in supermarkets. Hi, can I chill the egg Mayo overnight? Was thinking of making this the night before so that I won’t need to rush in the morn. You may do so. Perhaps you might want to keep the egg separately from the mayonnaise dressing till the next morning, and mix in only ready to serve.